Pacquiao v Rios "The Clash in Cotai"
It's fair to say that whilst this weekend is choc-a-block with boxing action around the world only one bout will really be getting global attention. Manny Pacquiao v Brandon Rios. It may only be for the WBO International Welterweight title, but it's still a bout so big that it's got almost everyone in boxing talking. It's one of those special bouts. The poster put out by Top Rank might not be "special" but it's got a very intense look about it that seems to yell "explosive" and that's exactly what we're expecting from the contest. Pacquiao is, well, Pacquiao. A Filipino buzzsaw, who this time enters the ring with many doubting he'll ever be the fighter he once was. Rios, whilst not a global boxing star like Pacquiao, is a must watch fighter who lacks a great defense though makes up for it with heart and a warrior spirit. This should be special. 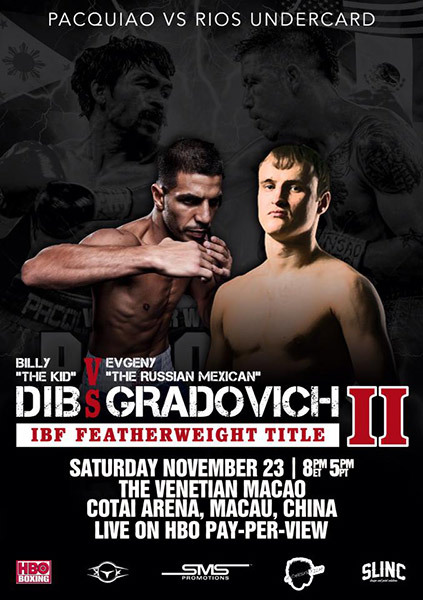 Amazingly the Pacquiao-Rios show doesn't just have a special main event but it also has a special co-feature, one that has had it's own poster developed as Billy Dib seeks revenge over Russian Evgeny Gradovich. This IBF Featherweight title bout has some how gotten an under-card poster thanks to Body Punch Boxing Gym.